Thunder from Down Under Las Vegas has been pleasing the crowds of screaming women for over a decade. This 75-minute show highlights the chiseled bodies of several male dancers as they dance with high energy that is matched by the energy of the audience. For over two decades Thunder from Down Under has thrilled audience members from around the world while performing their nasty moves on stage. Thunder from Down Under brings out the animal instincts of raw sexuality. All the men have sculptured bodies that look like a Greek god. Their splendid personalities helps move the show forward while patrons are asked to join them on stage for some bumping and grinding with those hard sweaty bodies. The Kiwi cast from New Zealand includes Aidan, Clint, Leigh and Dave. These chiseled men have been performing with the show for quite some time and their bodies as well as personalities are one-of-a-kind. Although this set of entertainers are beginning to show their age in the face, their dance moves and buff bodies are as young looking as ever. No matter whether the dancers are from Australia or New Zealand they tend to leave nothing left to the imagination when they are through with their routine. Thunder from Down Under has many choreographed themes throughout the show that highlights costumes which are usually removed fairly quickly by the dancers. Themes which are explored include a muscular milkman waiting to sweep that unsuspecting housewife onto stage. Another scene is played out by Tarzan who jumps on a table, gets chased by a gorilla and eventually is drenched by a beer. The performer’s body shimmers with little bubbles flowing off his body. 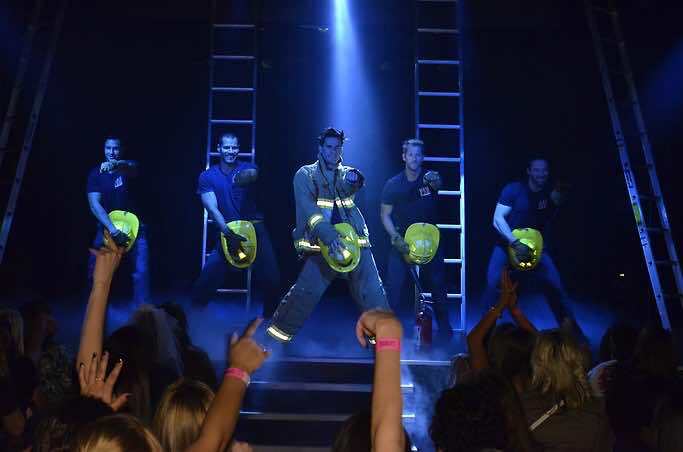 Thunder from Down Under has more for guests when someone from the audience is brought on stage in handcuffs and proceeds to be twerked from all sides by a sculpted policeman. Another segment of the show might include a sultry dance that starts on a bed made of feathers and ends with a flamboyant leap across the stage. Uptown Funk is creative and the men are downright dirty as they sway their hips as well as thrust their bodies in different directions as the audience cheer loudly with approval. Thunder from Down Under is extremely loud and buzzes with excitement as the many fans shout out their pleasure. The stage performances are choreographed to a variety of music which energizes the different dancers to a heightened frenzy. Each dancer likes to thrust their pelvis in every direction that lets the audience see more and more flesh. Thunder from Down Under performs at their namesake theater within the Excalibur Hotel and Casino. The showroom is perfect for lots of interaction with the sexually heated audience. Tables are comfortable with great sight views of the men on stage as well as the male dancers that perform within the crowd too. There are also packages available for bachelorette parties, a girl’s night out or a birthday party. Men do attend but the audience is primarily females who are looking to watch some hunky male eye candy dance provocatively during the show. Thunder from Down Under is the ideal all-male revue when a person is looking to view some interesting dance moves by some scantily clad buffed out men. The screams are loud, the dancers are handsome and their bodies will leave the audience drooling with carnal thoughts of nastiness for days and nights in the future. Thunder from Down Under Las Vegas is performing at their namesake showroom located within Excalibur Hotel and Casino. The seating is intimate and allows for maximum audience interaction. The show is open to patrons that are 18 years of age or older. The show runs nightly at 9:00 P.M. with additional performances on Friday and Saturday at 11:00 P.M. Packages are available for bachelorette parties or your next girl’s night. Thunder from Down Under Tickets are on sale now and range from preferred seating to that perfect up close and personal VIP view.